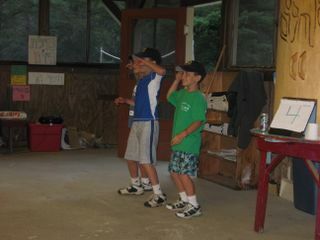 It's been a great few days here at machane Ramah! We had a very good 1st Shabbat. The campers learned Shabbat tfill'ot, had so much fun at the shabbat dinner, and they had a great activity during shabbat afternoon with Yehuda Gubani. Yehuda is an ivrit teacher here and he's been here more than 20 summers so far. The kids enjoyed his peula. well, it was a long and fun day… but tomorrow we are going to Six Flags…. so everyone is so excited!! !